Get some of that gorgeous fabric out of your stash and out on display. This is a fun way to turn those college textbooks that you just can't toss into pretty risers for collectibles. Remember when you used to cover your schoolbooks with grocery bags? Use that same technique with fabric - just trim and fold it to fit around your book. You can tuck the book covers into the fabric flaps, or just fold them inside. Super cute way to brighten up a bookshelf! I'm totally psyched to be part of my friend Ann Butler's blog hop to celebrate her new line of stamps! EZ-De's Easy Design Elements is a collection of clear polymer stamps (made in the US!) that work together to create tons of different patterns - like quilt blocks. They're also available on red rubber through Unity Stamps. I made a square greeting card using the hexagon checkerboard stamp with some pale ink tones. Such a cute pattern, even if my edges are a little tipsy slipsy, lol. I embellished the card with silk ribbon, clear stickers and these cute vintage wood game pieces that I topped with metallic gems. 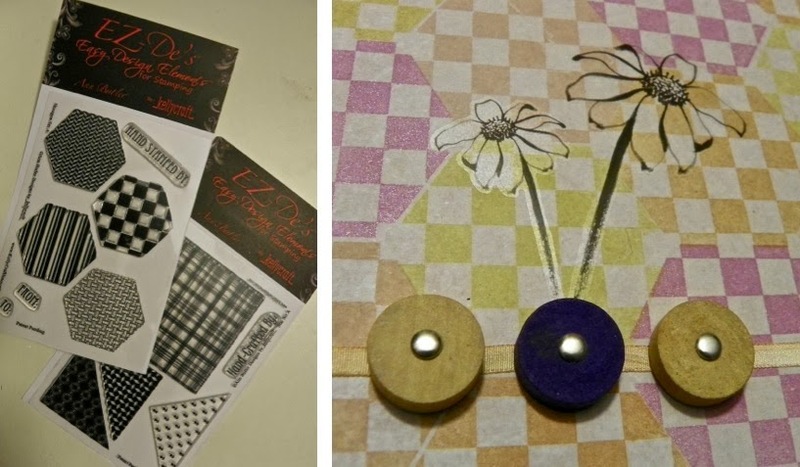 Be sure to visit all the other wonderful designers' blogs to see what they created with Ann's stamps. I'm thrilled to be participating in this very special exhibit - Banners of Hope. Dozens of designers are stitching up artistic banners with messages of hope to hang in an exhibit at the CHA Mega Show in January. This is the first project hosted by the new Fabric Arts Council, a group of buyers, sellers and designers within the CHA membership. For my banner, I cut this large flower from a printed upholstery linen that has been sitting in my stash a long while (Cassandra by Duralee Fabrics), which I accented with coordinating colors of glitter, painted on with clear gel glue. The three brads each say the word "hope." At the bottom, I glued a black metal bookbinding strip, covered with olive green washi tape. The metal tag at the bottom says "encourage your hopes, not your fears." 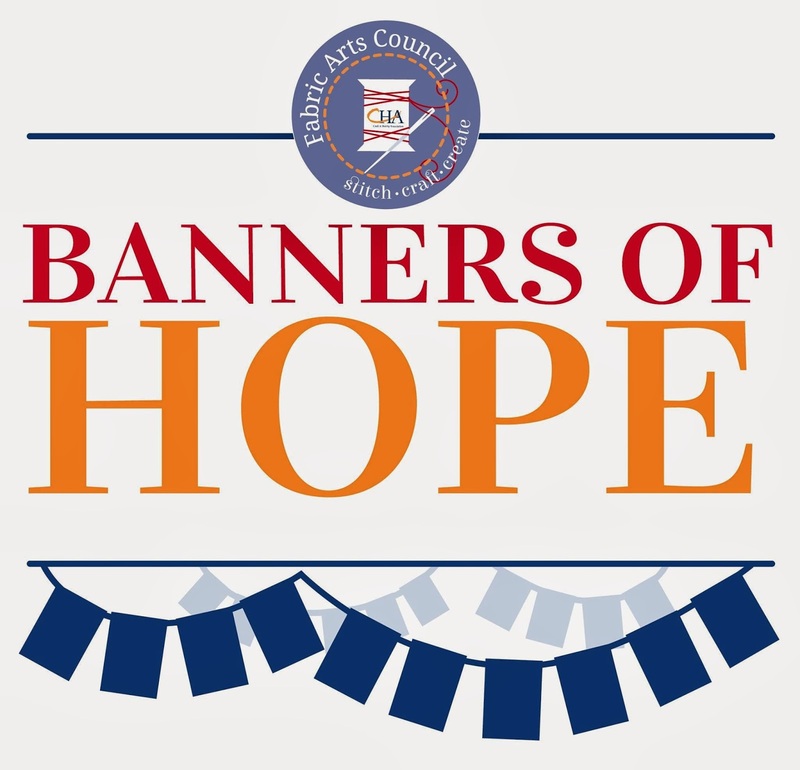 After the CHA show is over, the banners will be displayed as part of fundraising efforts for the Charity Wings Art Center. The exhibit will then travel to various charitable events and organizations throughout 2014. Kumihimo Christmas ornament with Dazzle-it! I'm totally addicted to Kumihimo, a Japanese braiding technique. I especially like how it looks with a thick cord. So when my friend Carmi asked me to be part of a blog hop using Dazzle-it! faux suede cords and tassles, I knew exactly what I wanted to make. Kumihimo is super easy to learn - this is the first time I used it to make a Christmas wreath ornament, as opposed to a necklace or bracelet. It takes 16 feet of cord to make this 7 inch piece - the braid is a little more than 1/2" in diameter. After braiding the cord, I tied off the ends and tied them together to form the loop. I slipped some thick gold wire into the knot, threaded a couple of beads on to it, then bent a small loop at the bottom so it nested inside the knot and bent the top into a large hook. I colored the silver tassel head green with alcohol ink, put it on an eye pin, poked it through the knot and bent a loop on the back to secure. I trimmed the tassel ends just a wee bit so it hangs nicely inside the wreath. Lastly I tied a ribbon around the wire and glued on a large button to hide the knot. The ends of all the cords coming out of the knot are wired together in a bunch, pushed to the back and trimmed short so they aren't visible from the front. Click here to visit the Dazzle-it! blog and check out their Facebook page. Happy holidays! How about a giant and whimsical - yet super lightweight - Christmas ornament to hang from a ceiling hook or in a doorway? I recently made this one for DecoArt, using their new Americana Multi-Surface Satin paints, which work beautifully with any surface. 1. Push a skewer into the starter hole at one end of the 2” ball and slowly force it all the way through to the other side. Keep the skewer straight so it stays centered and twist it as you come out the other side to prevent cracking around the exit hole. Repeat for the 3” ball. For the 6” ball, push the skewer in about halfway, then remove an push it in halfway from the other side until you have “drilled” a hole all the way through the ball. 2. Paint the 3” ball with two coats of red and the 2” ball with 2 coats of green; allow the first coat to dry completely before adding 2nd coat. 3. Press a strip of tape horizontally around the ball’s center seam. Peel off the paper liner and press a length of narrow ribbon to the tape and trim off the excess. 4. Push a row of straight pins around the red ball, above and below the ribbon. Clip off the pin tips if they are too long. Repeat for the green ball and set aside. 5. Draw four “football” shaped ovals on the 6” ball with a pencil, from the top hole to the bottom hole. If you prefer, you can measure and cut the shapes from paper (use the edge of a dinner plate to trace curves) and tape the paper templates to the ball to trace. 6. Place the ball on top of the tuna can to hold it steady as you paint the top half of the ball. Alternate the red and green to paint the four ovals along the pencil lines. Allow the first coat to dry, then add a second coat and allow to dry. Turn the ball over and repeat for the bottom half. 7. Paint the spaces in between the ovals with one coat of gold and let dry, doing one half of the ball at a time. 8. Brush a thin coat of glaze over the gold areas on the top half and cover with glitter. Tap off the excess and let dry. Brush away excess glitter from the red and green areas, then repeat for the bottom half. 9. Apply strips of tape along all the lines – try to keep the adhesive mostly on the painted area - it sticks better there than on the glittered area. Remove the paper liners and press narrow ribbon on to each strip. Trim off excess ribbon at the top and bottom of the ornament. 10. Put the holiday charm on the end of the floral wire and twist the end of the wire up. Thread a few beads on to the wire above the charm, then the 2” ball, a few more beads, the 3” ball, a few more beads, a round filigree charm (large enough to cover all the ribbon ends), the 6” ball, and lastly another filigree charm. 11. Fold and twist a long length of wired ribbon into a large bow and pin it to the top of the 6” ball in front of the wire – be sure to decide which panel of the ball you want to call the front. 12. Bend the remaining wire into a loop and coil the end around the base of the wire at the top of the ball and push a pin through the coil into the ball to secure the loop for hanging. Check out the current issue of Bella Crafts Quarterly - lots of great project tutorials, including my project! I etched the sides of a large glass dish from Crate & Barrel with gingko leaves. It's super easy to do with Etchall Etching Creme and Martha Stewart Adhesive Silkscreens. The finished project shot along with my supply list and complete instructions are on page 53 of the Winter 2013 issue. Click here to view it online or download it for free! Today is the first Monday of the month - time for a blog hop with the Designer Crafts Connection! After you're done here, click the DCC logo in my sidebar to hop to the next blog...then look for the same logo on that blog to continue on. Our theme this month is holiday decorating - which I haven't done much of in years, although I do have some really cute ornaments that I've collected over the years. I wasn't sure what I would make, but then I was watching some birds outside and saw this forgotten trellis leaning against the fence. It's about 16" x 40" and I realized that it would be perfect for displaying some ornaments - yay! So I gave it a coat of bronze Glitter Blast and propped it between some bricks inside a planter box. I made a sign on the computer for the top, and filled the planter with fake pine garland, accented with real pine cone flowers from my friend's tree. Now my holiday decorating is done! 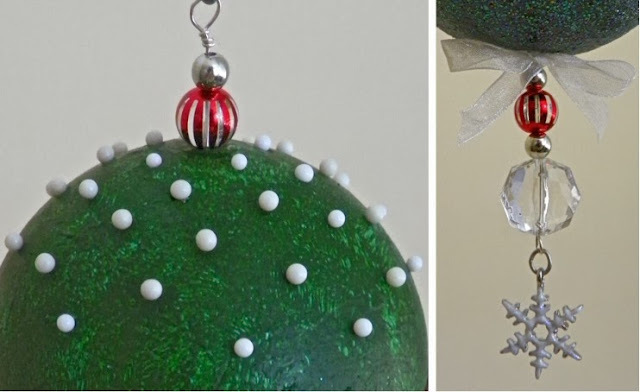 For more great ideas for handmade ornaments - check out the Twelve Balls of Christmas over at the Smoothfoam blog! The good folks at Prima Bead sent me a selection of beads to make a statement necklace that one could wear on New Year's Eve. I think this piece would look bold and fabulous over a solid shell or sweater. For those who prefer their necklines to plunge, it would also hang nicely against the skin betwixt the girls, tee hee! I added three hand-blown clear glass beads from my stash, as well as a black glass buckle-style focal bead. The necklace is strung on a .015 nylon-coated stainless steel wire cable. I really like the pop of red, too! 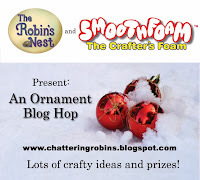 I'm delighted to be part of this holiday ornament blog hop, using Smoothfoam and products from The Robin's Nest. There are lots of designers to see - be sure to visit the TRN blog for the complete list of links. I made a sparkly tree topper with a Smoothfoam disc that I embellished with these cute Dew Drops plastic gems that come in lots of different colors and shapes. First I painted one side of the disc with a clear gloss glitter paint, then I glued pretty holiday papers from TRN around the back and sides. I used a clear gel glue to adhere each gem, one by one, into a repeating circular pattern. I really liked having a variety of circles, teardrops and diamonds to work with. The last step is to insert a painted dowel into the bottom of the disc and it's ready to poke into the branches at the top of the tree and secure with a little hidden twist tie if needed. 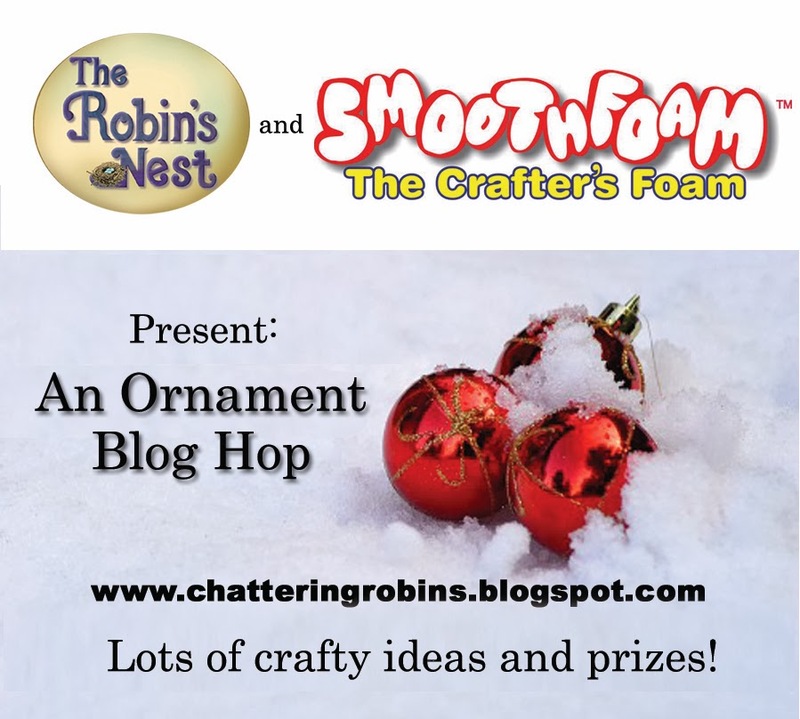 Leave a comment here to be entered for a chance to win a great prize of crafty goodies from Smoothfoam and The Robin's Nest - enter on each blog you visit in the hop! Today is the first Monday of the month, which means it's time for a Designer Crafts Connection blog hop! Click on the blue DCC logo in my sidebar to hop in either direction to the next blog, then look for the logo on each blog to continue hopping through them all. This month it's all about handmade thank-you gifts. I think a handmade ornament is a lovely thing to give someone as a thank-you. It's great for a hostess gift too, with the holiday party season coming up. I will be sending this particular ornament to my friend Genelle - not as a thank-you, but as part of an ornament swap for Charity Wings. Here's how I made this Christmas ornament - it went together pretty quickly! 1. Poke a skewer into the ball's starter hole and slowly push it straight through to the other side, to turn the ball into a bead. Leave the skewer in the ball to use as a handle while you paint it light green; let dry. 2. Sponge-paint a coat of dark green on top of the light green and let dry. This gives the ball a nice texture, like forest greenery. 3. Apply a coat of Mod Podge to the bottom half of the ball (use the center seam as a guide), then sprinkle with glitter. Let dry. 4. Press a strip of decorative self-adhesive ribbon around the center seam. 5. Push several ball-head pins into the top half of the ball - I spaced them rather randomly to look like little snowballs on the green. Twist and remove the skewer. 6. Thread a few beads for the bottom of the ball on to an 8-9" length of wire. Use the round-nose pliers to make a twisted loop at the bottom. Thread the wire up through the bottom of the ball and add a couple beads to the top. Make another loop at the top, leaving about 1/8" of wire between the top loop and the top beads. 7. Push the ball up on the wire so the 1/8" space is above the beads at the bottom, then tie a little bow with chiffon ribbon on to the wire. 8. Use pliers and a jump ring to add a charm to the bottom loop - and your ornament is ready to hang! For lots more great ideas for holiday decorating, check out the Smoothfoam blog! Handmade Holidays Blog Hop: Treasure box and a key chain - plus a giveaway! I'm thrilled to be part of the 3rd Annual Handmade Holidays blog hop! The complete list of participating blogs is at the bottom of this post - along with a chance to win an awesome prize package filled with crafty swag. A bevy of crafty designers have come together to share all kinds of fabulous ideas for handmade holiday gifts—there's sure to be something here for everyone on your list. I decided to make a treasure box with a fun and funky key ring inside. I used Smoothfoam balls so the key ring will float - nice gift idea for those who love sailing or fishing. I love altering boxes and making the box part of the gift, too. 1. Paint the box inside and out - use a smaller brush to carefully paint around the latch and hinges; allow to dry. 2. Glue suede cords around the bottom of the box, starting and ending at one of the back corners. Repeat around the top of the box, starting and ending at the front latch. Glue four pieces of suede cord to frame the panel on the lid. 3. Trim scrapbook paper into rectangles to fit inside the inset panels of the box and glue into place. 4. Glue two flat accent beads over the edges of the cords on either side of the latch. 5. To make the keychain, poke a skewer straight through each Smoothfoam ball to turn them into beads, then enlarge the hole a bit more by slowly twisting the handle of a small paintbrush through the ball. Paint each ball with two coats and let dry. Brush on a coat of glaze and let dry. TIP: Use the handle of a paintbrush to hold and spin the ball as you paint and glaze it. Set the brush inside a glass to dry (with the ball still on the end). 6. Put a seed bead on a few straight pins, then push the beaded pins into the center of the balls to accent. 7. Fold a 16" length of suede cord in half and loop it around a keyring as shown. 8. String a large-hole bead on to the cords - leave a little space between this first bead and the keyring so the cord loop can easily slide around the ring as keys are added. 9. String the first Smoothfoam ball (use a long straight pin if needed to push the cord through the ball), a decorative bead, the second Smoothfoam ball, a final bead, then tie the cords into an overhand knot or two. Trim the ends. I really like these vintage images from the Tim Holtz Crowded Attic paper pad...dusty and rusty! Here's a quick and easy greeting card I made with a reminder to enjoy the journey, wherever it takes you. I love how these wood and resin beads blend with this copper chain and a wood peace sign pendant from Prima Bead. If you have short hair, beads around the sides and back of your neck look really pretty. I found some smaller white resin peace sign beads at a consignment store to make matching earrings. This month I've been working with natural materials to make some new jewelry, mostly from Prima Bead - leather, stone, metal, wood. I did some Kumihimo projects a couple months ago and it was so much fun, I wanted to have another go. For this statement necklace, I made a basic Kumihimo braid with two colors of leather cord, green and yellow. I love how thick the braid turned out - it's about a 1/2" around. I trimmed, twisted and glued the ends inside some spare metal filigree cone findings I've had in my stash forever, using E6000 adhesive. Then I added a magnetic clasp with some sturdy jump rings. The braid was pretty enough to leave as is, plus I didn't think I'd be able to find something bold enough in the right colors to hang from it. But my stash served me well - I happened to have these large, flat beads in the right shapes and colors. The circle is shell (1-1/2" diameter) and the rectangle is stone (1-1/2" long). I placed a natural pebble bead in between and coiled the top eye pin around two of the individual cords. The combination of leather, shell and stone makes for a lovely organic look. I really like how this turned out! Since World Cardmaking Day was just last week, I created a couple Halloween greeting cards. The Classic Squares dies by Spellbinders were perfect for creating window frames from black cardstock - the dies stay right where you want them with the magnetic mat. The Westcott trimmer sliced through the Rowlux sheets like buttah, and the non-stick surface of my Westcott scissors made it much easier to trim little strips from the double-sided Tacky Sheets. And when that shiny black Tulip Glitter hits those Tacky strips, it stays put beautifully. I placed white cardstock behind the orange Rowlux in each die-cut window so it looks like it's glowing, when compare to how the Rowlux looks against the black cardstock. With some fun little resin stickers, black gems and creepy rubber spiders, my cards are frighteningly fabulous! Click here to enter to win an awesome selection of Graphic 45 paper, diecuts and embellishments - good luck! Check out the links below to see what the rest of the designers on the hop did with their supplies. I really like the new DecoArt Multi-Surface Satin Acrylic Paint - I'm going to be using these bright seasonal colors on lots of projects, I think! After sanding the wood, I painted one coat of each color and dry brushed brown around the edges to distress it. I painted the bottom and back of the tray with brown, too. I added a sepia-toned image of leaves and pinecones to the front panel using Craft Attitude printable film. Then I finished it off with some bronze-tone metal accents. Perfect for keeping pretty scrap papers and envelopes on hand. 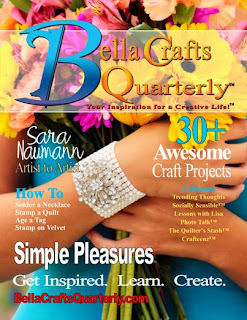 Be sure to click on the "hop" links in the Designer Crafts Connection logo in my sidebar to see what lots of other designers are making this week...inspiring! I'm thrilled to be kicking off this year's Halloween blog hop with Craft Attitude! This week and next, you'll see lots of verrry scary Halloween projects from some fabulous designers. I made this freestanding "full moon" decoration using a variety of clip art. Set it on the party table, dinner table, coffee table, bookshelf, fireplace mantel - anywhere you need a little Halloween spirit. Craft Attitude is a sheet of film that you print on your inkjet and then adhere to virtually any surface. It's a super fun and easy way to create with your favorite imagery! It looks especially cool on textured surfaces because the film settles in to all those nooks and crannies...you don't even know the film is there. It's like the surface came custom-printed with your images. Here's how you can make this Halloween decoration for yourself - enjoy! Select or create the images you want to use - I used clip art from Microsoft - and print them on to the Craft Attitude film, following the package directions. You'll need images for four sides of the cube, both sides of the disc, plus the edge of the disc. Gang up as many images as you can to fill one sheet of film - I used Powerpoint to this. Cut some acetate down to a 3" square to use as a crop guide, place it on the printed sheet and trace around it to get the desired crop. Cut out all the images to their final sizes. Cover the surface of one side the Smoothfoam cube with the glue stick - be sure to get glue all the way out to the edges. Peel back the liner of the film on one corner of one image and position it, image side down, on to the surface of the cube. Rub the image down, then slowly peel off the liner, leaving the film adhered to the cube. Rub the image with your fingers to work out any creases or air bubbles if needed. Repeat for the rest of the cube and the disc. Color the edges with a black paint marker to give each image a finished look - this also hides any of the white surface that might be peeking out. Adhere black cardstock to the top and bottom of the cube. Use a 6" skewer (trim as needed) to poke a pilot hole into the bottom edge of the disc - about 3" in. Pull the skewer out and then poke it down through the top center of the cube to the bottom, leaving 3" of skewer sticking out. Place the disc on top of the cube by putting the skewer into the pilot hole of the disc. Position the disc on the diagonal to the cube. Add some self-adhesive gems to the top of the cube, and embellish the disc with little dimensional charms or die-cuts if you like. For even more inspiration, follow Craft Attitude on Facebook! The good folks at Prima Beads sent me a lovely selection of beads and metal charms that I've been creating with this week. My last bit of pre-holiday cheer (before I switch over to Halloween mode) is this Christmas tree wallhanging. And don't forget to enter to win your own selection of holiday beads and charms - tomorrow is the last day - click here for the post with the entry widget! I started with a 6"x12" sheet of Smoothfoam and painted it with textural stucco paint blended with green ink. Then I dry-brushed some darker green paint on top, and added some clear glitter paint for a final coat to give it more dimension. I bent pieces of wire into a leaf shape with one longer end which I bent down so each leaf could be poked into the foam. I wanted the tree to be a bit lumpy and full-looking, like a real tree would look (in an abstract way)...not a perfect triangle. In order to keep some of the charms from sliding away from the leaf points, I glued a small silver bead near the point as a stopper. To make the tree-topping star, I slid beads on to long head pins, bent the bottom ends down and pushed them into the foam. I thought this was a fun, mixed media way to display a variety of metal charms from Prima's 'Tis the Season line! This is another one of my holiday projects for the good folks at Prima Bead...they recently sent me a huge box filled with beads and charms from their 'Tis the Season line. These large-hole glass beads and metal spacers are quick and easy to add to a pretty chain like this stainless steel serpentine. The charm in the center is a cute little Christmas tree. What I love about these beads is that you can quickly switch up your necklaces to match the season or your outfit any time you want! Be sure to enter my giveaway for your chance to win some super cute beads and charms for your own holiday crafting - click here for the post with the contest entry widget - good luck! A holiday cocktail ring - with a giveaway! For one of my projects this month for Prima Bead, I made a holiday cocktail ring...a cute cluster of mini crystals in red, green and clear. Meet Balsa, my lovely hand model, lol. Anyway, what I love about these bicone beads is that they are ready-to-go right from the package - they come pre-loaded on to little silver head pins with eyes at the top. All I had to do was string them on to a long piece of silver wire, then I gathered them into a cluster right in the center of the wire. I bent the wire in half and ran both ends down through the center of a flat connector charm. Because I started with a super long piece of wire, I was able to loop the ends together and do a coiled wire wrap so it's sturdy and smooth. I'm happy with how it turned out; it makes a lovely holiday cocktail ring! Now for the giveaway - I have a lovely selection of Christmas beads and charms from Prima up for grabs! One lucky winner will be picked on Saturday, September 28 - good luck!